The images streaming in from London and other cities in the UK that are being struck by riots and looting are scary and unpleasant, but that doesn’t mean they have to stay that way. After all, this is the country whose most famous comedy troupe is Monty Python, and their leader during World War II’s darkest days was a cigar-chomping, roly-poly man with a quick wit and a ready quip named Winston Churchill. The British can handle anything, and do so without losing their sense of humor. 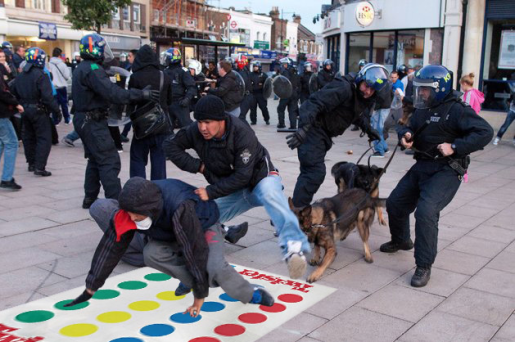 Hence the rise of humor websites in which Britons are having a little fun with their riots, thanks to Photoshop. Of these sites, the oldest and most famous is a Tumblr-powered website called photoshoplooter. That’s where you’ll find images of rioters putting on makeup, stealing Barbie dolls, playing Twister, putting on puppet shows, and even playing Double Dutch while skipping rope. These are scary times, especially for business owners, but it’s great to see that the British haven’t lost that British sense of humor throughout the civil unrest.